Divorce Settlements: Why I Don't Care What's Supposedly "Fair"
When people talk about divorce settlements, they use words like “equitable” and “fair” and “good” and “get” and “normal” and “win”. Confession: I hate those words. My ex-husband and I had a decent pile of assets. We owned two houses and a business that operated in multiple locations. To put it most simply, an “equitable” settlement would have meant that we both walked away from the marriage with a house and a store. Also, my ex made a lot more money than I did, so it would have been “fair” for him to make support payments to me, at least for a little while… maybe enough to pay for me to finish college. After all, I was “entitled” to at least that much, right? Maybe. But… I didn’t want half of everything. It wasn’t necessary. My husband was in charge of at least 90% of the business and he worked incredibly hard to build it. I didn’t want to take that from him. I didn’t want either of the houses because I didn’t want to live where they were located. I (we) also didn’t care for the idea of liquidation. I didn’t even want half of the contents in our home because… well, I just didn’t. In the end, I left a lot more than I took. When determining the division of property, we didn’t look at numbers alone. We worked as a team, brought our humanity to the table, and considered our individual goals, values and needs. The way my ex and I decided to divide our assets wasn’t exactly “fair” or “equitable,” but it was “appropriate” for us. 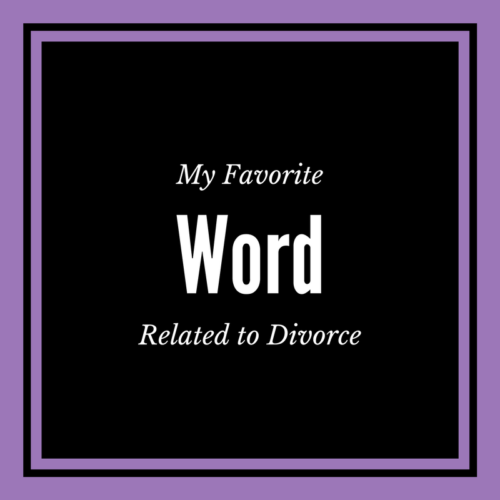 And that’s why “appropriate” is my favorite divorce-related word. It removes comparison and recognizes the unique individuality of the people and families in question. “Appropriate” doesn’t denote winners and losers. “Appropriate” is known only by the couple in question, not the judge. What would happen if we, as a culture, more fully recognized the human side of divorce settlements? What if we looked beyond numbers and rules? What if we went into a divorce looking not for a “fair” outcome, but an “appropriate” one? I have faith that the tide is turning… eventually, this will be the norm. Eventually….